"Poster Session Award Winners" UP!! We would like to express our deepest sympathy to those affected by the terrible earthquake and tsunami that hit the Tohoku region in Japan in March, 2011, and by the succeeding Fukushima nuclear power plant accident. The main topic of our forum is motivated by this catastrophic disaster: we sincerely feel that it is our responsibility to make use of mathematics for predicting natural disasters, recovering from catastrophic events, and making provision for the future. Thus, we have thought that the Forum "Math-for-Industry" in this year should be fully devoted to discussing a large variety of possibilities for using mathematics to these purposes. There are additional reasons for this choice. First, this year we expected participants (including speakers) to come from New Zealand (where there was a big earthquake in February) and Chile (also the location of a big earthquake last year, whose related tsunamis reached Japan, on the opposite side of the Pacific Ocean). Second, the word "tsunami" ("津波" =harbor wave (in Japanese)) made its way into the English language through Hawai'i. After the Hawai'i islands suffered from the big tidal waves caused by the 1946 earthquake near Alaska, the first-generation Japanese immigrants in Hawai'i introduced the spoken word into the English language. Our objective is to consider what help can mathematics provide against natural disasters: to understand their fundamental mechanisms; to increase the accuracy of predictions, to minimize damages and risks; to establish more robust and efficient social systems for recovery; and so on. 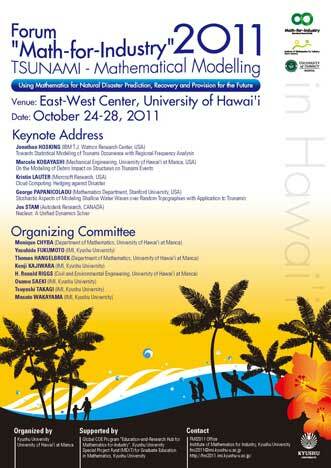 Thus, the lecture theme includes the following research topics: tsunami, earthquake, environmental pollutions, logistics, optimization, control theory, statistics and data analysis, information security, CG visualization, PDE, inverse problems, numerical analysis, fluid dynamics, integrable systems (solitons), geometry and topology, etc. On this occasion, we will inaugurate the Asian Consortium of Mathematics for Industry (ACMI) in the East Asian and Pacific areas, an idea planned since the fall of 2009. ACMI aims to create a strong international platform for development of worldwide activities involving mathematics for the industry. Copyright© 2011 FMI2011, Kyushu University All Rights Reserved.